Karina's Kreations: Quick Birthday Card! This is an easy, super fast birthday card. It uses the notecards from the Stampin'Up Idea Book & Catalog. You get 20 cards with matching envelopes for only $7.50. 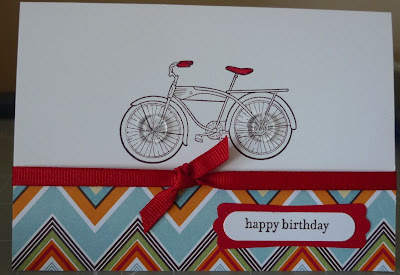 The stamp set is called Pedaling Past from the Summer Mini catalog. I stamped it in Early Espresso ink on the note card. The designer paper is called Greenhouse Gala. It's a new paper in the Idea Book & Catalog. The greeting is from Teeny Tiny Wishes stamp set and is stamped on Whisper White card stock and punched out with the Word Window punch. It was layered on Real Red card stock that was punched with the Modern Label punch. Real Red 1/4" grosgrain ribbon finished off the card but I had to add two Bitty Buttons to the wheels of the bikes. They are so cute.